I entered the venue with a lot of anxiety, as it was going to be the first ever hackathon that I was to participate in. I am a big introvert, so going out and making a team was out of question for me. However, on reaching the venue, the folks from TeleStax greeted all of us there. Now after a long time sitting alone, I came across this like-minded professional developer with a good Java experience under his belt. I am a Python developer, so this could turn out to be a good team to make, I said to myself. Soon, our team of Telefire came about and consisted of two seasoned developers, myself (Apurva A Kunkulol) and Nikesh Shetty. The team was formed, but amusingly we were still not clear as to what we were going to make using the resources that various companies had provided us with. Therefore, we decided to take a walk. In the course of our conversation, we stumbled upon the problem that many large sized complexes, and other buildings that use fire warning and control systems, might face, that of human intervention in the case of a Fire breakout. Wouldn’t it be great if we could do something in that direction, I said to Nikesh! We agreed and Telefire is what we named it. We were thinking what the actual problem at hand is. Therefore, we were refining the problem statement. Since these buildings already had fire alarms and systems in place to deal with an outbreak, what is it that we could provide, as an edge over the existing system? So we imagined a scenario, where the complex is large and the fire has already broken out, and even if the security post was not manned, there should be something that gave an alert to at least the occurrence of a fire. This would mean that the security officer would not have to stay in his place all the time, monitoring what’s happening around the complex. We used Java to create the APIs and, the Tools provided by TeleStax to create an IVR system that immediately called the owner in case of a fire outbreak. After having worked on creating the IVR system and having created, the content of the notifications, I started working on the pitch. Though a short pitch, I had worked hard on it and presented it entirely, to the audience. I started with the problem statement at hand. Then went on to explain how our idea offered a solution to the need and how it would help them to achieve lesser interference from humans. 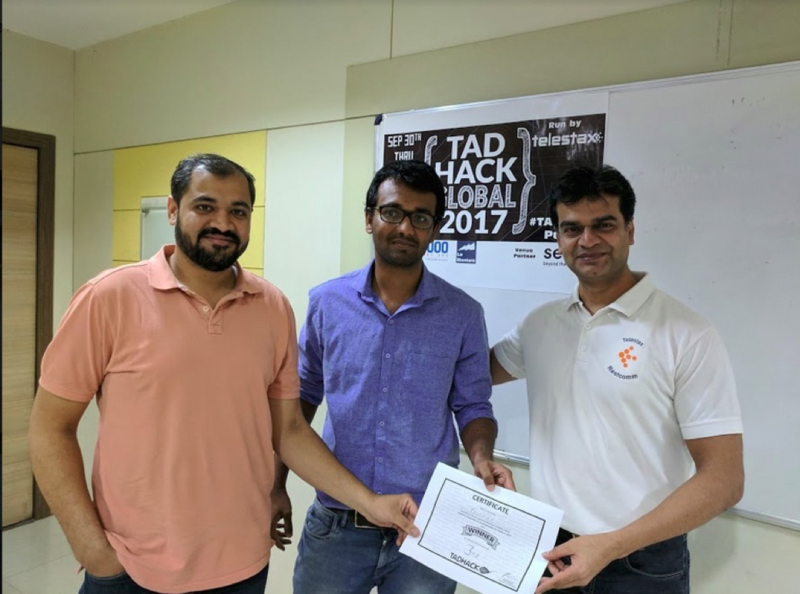 Then Nikesh went ahead to show how we had developed the APIs and how they made a call to the APIs provided by Telestax, so that an automated call could be made to the registered users and they would be alerted about an outbreak at their property. Everybody seemed to like it. We also answered some questions after the pitch and enjoyed answering them as well. Many of them asked questions that made us think again about our idea and reminded us of the fact that the job hasn’t even started yet, if we looked at this as a long-term solution. Finally, we were done with it, relaxed and curiously listened to the pitches to the interesting ideas that the other teams had developed. Lastly, we even won the third place in the Hackathon. We both wish to come back the next time and with a better idea that would be capable of solving another kind of problem.